How do we know which social and economic policies work, which should be continued, and which should be changed? Too often, we allow policies to be guided either by inflexible ideology or random desperation. Instead of identifying errors and pitfalls beforehand, we wait until it’s too late to correct matters, or hold out for perfection instead of locating and pursuing what trial-and-error tells us is the best possible option. Jim Manzi founded a global software company that pioneered the development of experimental methods now used by dozens of the world’s largest corporations to set prices, pick new products, and identify and market to customers. In Uncontrolled, he argues that these same methods can be highly effective in addressing our most important social issues, ranging from improving our schools to increasing economic growth to reducing crime. Drawing on both his professional experiences and a systematic review of thousands of randomized business and social experiments, he provides compelling evidence that most widely-touted ideas for improving schools, government, businesses, and other complex human institutions don’t work. Further, those ideas that do work usually provide more limited benefits than their advocates claim. Manzi identifies a short list of specific programs, such as welfare-to-work, charter schools, and community policing, that have been shown to beat these odds, and argues for substantial investment in them. Interview With Jim Manzi: From Business to Politics, Experimenters Win, James Poulos, Forbes.com. The Science of Policy, Ronald Bailey, The American Conservative. Great Experiments, Arnold Kling, National Review. 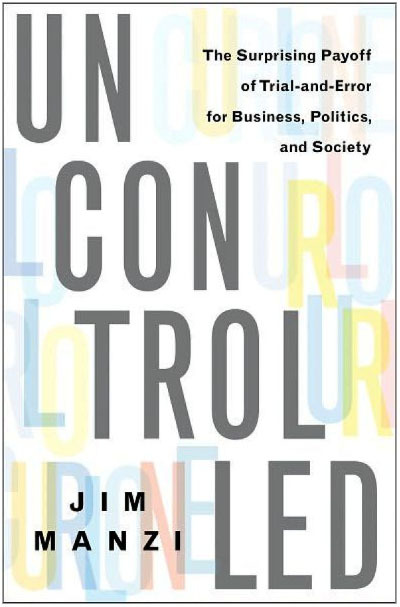 "In his impressive first book, Uncontrolled: The Surprising Payoff of Trial-and-Error for Business, Politics, and Society, entrepreneur/intellectual Jim Manzi has the makings of an airport best seller in the genre of Steven Levitt’s Freakonomics and Malcolm Gladwell’s Blink. Indeed, Uncontrolled is far more reliable than those two sometimes-dubious tomes." Steve Sailer, Taki's Magazine Online. "Uncontrolled...is a vigorous book, pulsing with ideas." Trevor Butterworth, Wall Street Journal. Development Impact, David McKenzie, World Bank. "This is a truly stimulating book..."Tyler Cowen, Marginal Revolution. INTERVIEW: America Is Out of Control, Nick Schulz, AEI's The American. Liberal Nostalgiacs Don't Understand Jobs of the Future, Michael Barrone, RealClearPolitics. Recommended Reading, The Weekly Standard. Dinner with Jim Manzi, Arnold Kling, EconLog.